Today in Masonic history Benjamin Abrams passes away in 1967. Benjamin Abrams was a Romanian-born American businessman and innovator. Abrams was born Dorohoi, Romania on August 18th, 1893. At the age of 12 he immigrated to the United States. Once in the United States he would help support his family by becoming a piano tuner and by selling newspapers. In 1922, Abrams, along with Rudolph Kanarak, purchased the Emerson Phonograph, Company. Abrams would run the company along with his brothers. In 1924, they would change the name of the company to the Emerson Radio and Phonograph, Company. In the beginning the company struggled, although one of the first products that the company produced was a first of it's kind radio and phonograph combination. In 1932, Abrams introduced the "pee wee" radio, another first in the marketplace. It was 8 1/2 inches long and 6 1/2 inches wide. The "pee wee" would account for 60 percent of the radios sold from December 1932 to May of 1933. Emerson would lead the sale of "pee wee" radios until 1938 after selling more than a million units. During World War II, Abrams would shift the company to producing military items. This was at a time when Emerson held 1/6 of the radio market. Also during the war he would take the company public in 1943, offering stock publicly ally for the first time. 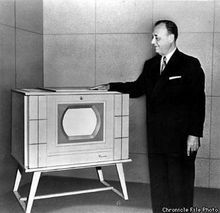 After the war, Abrams moved the company to producing televisions, in 1947 they offered a 10 inch tube television. Until 1965, when Emerson was sold, they move into other markets like air conditioning and they would also continue to innovate in the radio market. Among other products that the company would produce are some of the first clock radios, self-powered radios, and transistorized pocket radios and in 1955 began production of tape recorders. In his private life Abrams was a philanthropist. He would take an interest in general and Jewish affairs, giving to a variety of causes. He would also be a founder of the Albert Einstein College of Medicine of Yeshiva University, a founder of the Greater New York Committee for Israel Bonds and a founder and board member of the Federation of Jewish Philanthropies of Greater New York. Abrams would pass away on June 23rd, 1967 at the age of 74. He would pass away from a heart attack while out to dinner with his wife in White Plains, New York. Abrams was a member of Farragut Lodge No. 976 in New York City, New York.